What makes the 3-Wheel Golden Buzzaround XL different? The Golden Buzzaround XL is larger than the Buzzaround Lite, giving you more foot room for a full day of travel without discomfort. What are the 3-Wheel Golden Buzzaround Featuring a larger frame, a Delta Steering Tiller, and a plush stadium seat with adjustable height and width armrests, the Golden Buzzaround XL improves on the already superb Buzzaround Lite. 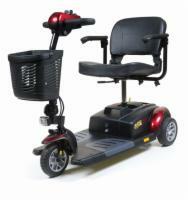 Whether you are a larger customer or just prefer more foot room, the Buzzaround XL has you covered. Additional features include a conveniently located charger port, non-scuffing tires, shiny silver wheel rims, and automobile grade carpeting on the scooter's platform.